British philosophy professor Teddy (Michael Jayston) comes back home from America the first time in nine years to visit his father, uncle and two brothers and introduce them to his wife, Ruth (Vivien Merchant). The family's working class background is vastly different from Teddy and Ruth's academic lifestyle, and the homecoming is uncomfortable for Teddy. But, unexpectedly, Ruth fits right in. While the men compete with one another, she not only enjoys herself but earns their respect. 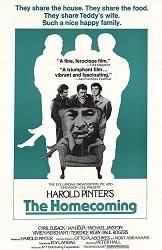 Also stars Paul Rogers, Ian Holm, Cyril Cusack and Terence Rigby.